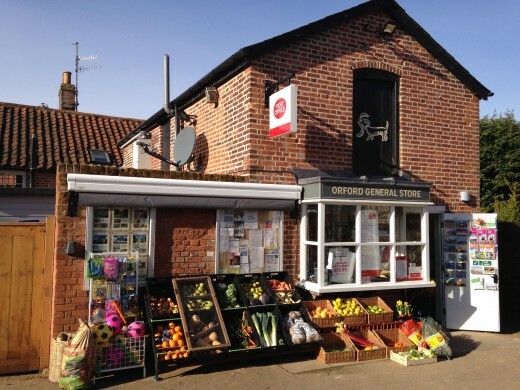 Regular visitors to Orford will notice a re-styled smaller village shop with a brand new open plan ‘Local’ Post Office. This is located within an enlarged area mainly occupied by the previous Butcher’s Shop. Our specialist Butcher’s Shop has closed, but pre-packed meat items continue to be available in the Shop from our existing suppliers. The new Post Office service is now available 7 days per week and has the same opening hours as the shop. It provides cash withdrawals, bill payment services, banking, foreign exchange services and a full range of postal services. The old cash machine has been removed. The majority of previous services and product ranges remain, albeit with fewer lines. Fruit and vegetables, bread and dairy continue to be stocked with a similar selection. The shop has all the basics for a village shop and we will continue to order in other products on request, even if they are not on the shelves. We offer a full dry cleaning and laundry service from Danes as well as services such as free glasses hire, special orders and home delivery. Pay-station, Lottery, Scratch Cards and Health Lottery are available as well as take-away coffees and packaged snacks. Pies and cheese are served from a small deli counter. We believe that the new streamlined shop, jointly funded with the Post Office, offers the basic services central to the life of the village.